Using a unique new metallic finish called 'IRIS', Unicorn Gundam is taken straight from the screen and brought to life in Tamashii Nations? premium G.F.F.M.C (Gundam Fix Figuration Metal Composite) line. The rainbow tint of IRIS gives Unicorn an out of this world look, perfectly accentuating the Psychoframe. Set includes interchangeable hands (x3 sets), Beam Magnum, Hyper Bazooka, Beam Gatling (left, right), shield, Beam Saber (x2), and display stand. 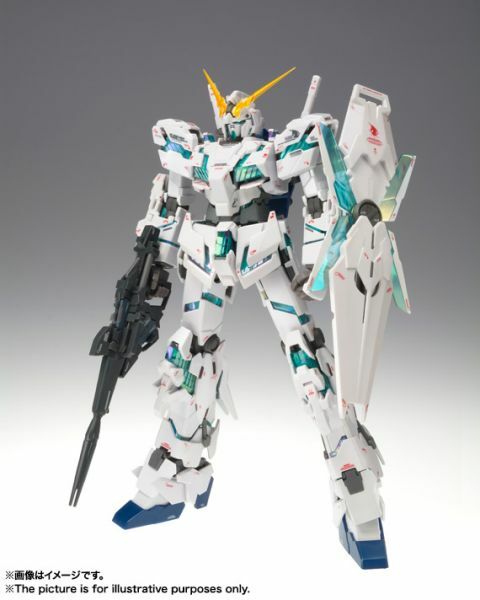 This spectacular assortment of accessories allows for the recreation of Unicorn Gundam at his finest!